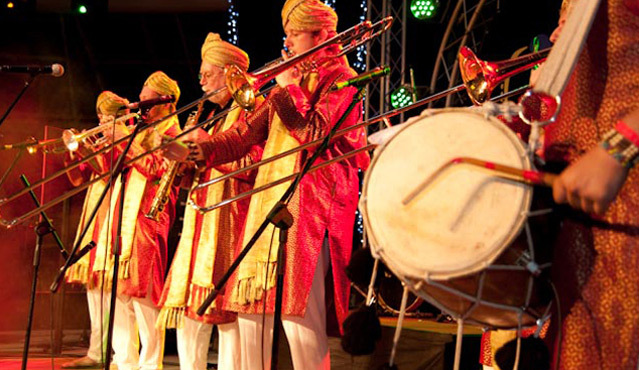 Bombay Baja are Europe's leading Indian brass band and specialise in performing at weddings, festivals, street processions and other high profile events. 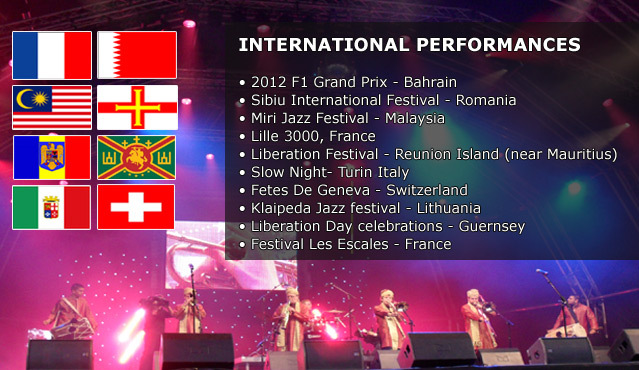 They have entertained crowds at events all over the world including: Malaysia, Bahrain, Italy, France, Switzerland, Reunion Island, Guernsey and Lithuania. They guarantee to create a carnival atmosphere everywhere they go and have even performed processions alongside horses, camels and elephants. They have performed for numerous VIP guests including Her Majesty the Queen, Steel tycoon Laxmi Mittal and celebrity Big Brother winner Shilpa Shetty. 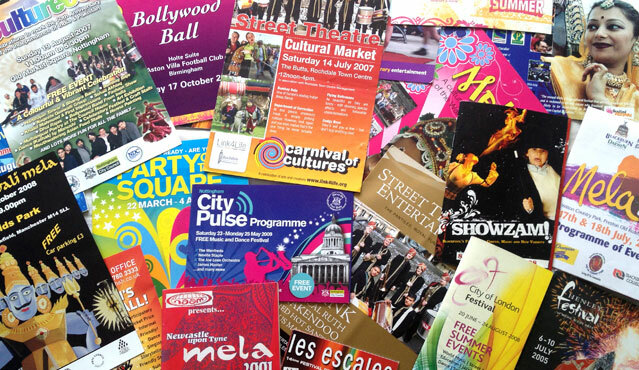 Bombay Baja have also appeared on a numerous TV networks including: CNN, Carlton TV, BBC news, Malaysian TV, Zee Asian TV, and Bollywood 4 U. 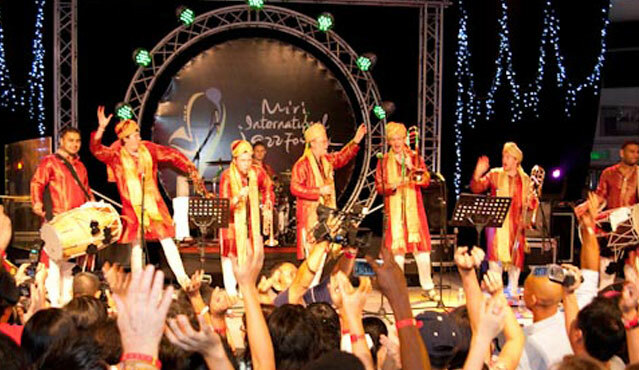 They have also made a live performance on BBC Asian network, Bahrain FM and the Radio XL Roadshow. 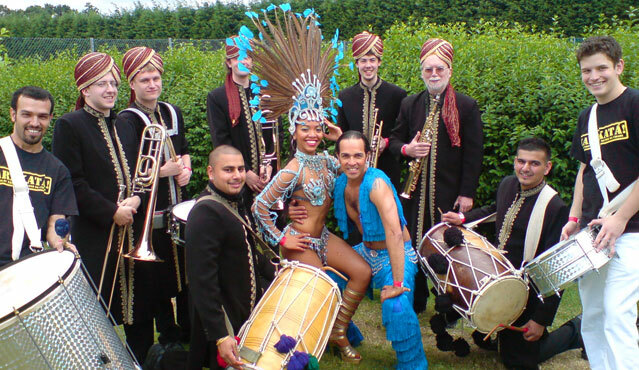 Bombay Baja Brass Band was established in 1998 and is based on the concept of traditional brass bands from the Indian sub-continent called Band Baja's. Band Baja's have become part of the Indian culture and play an essential role at any high profile event, they are regularly seen marching through the towns and villages dressed in their military outfits. 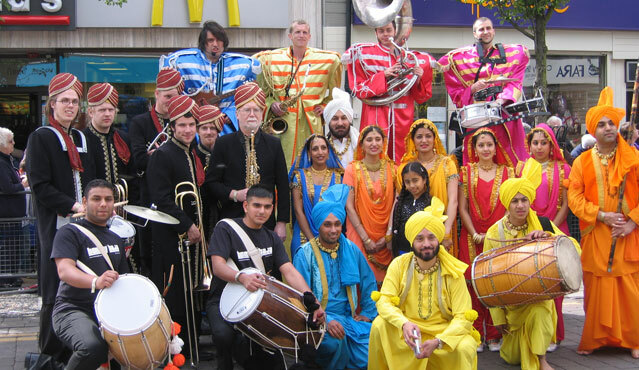 The band consists of musicians from a variety of musical backgrounds ranging from Bhangra to Jazz and Classical, they play a range of instruments including, Trumpets, Trombones, Saxophones, Dhol Drums and Percussion. 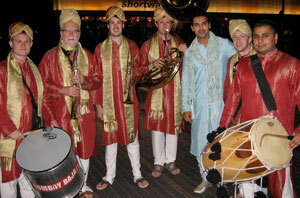 Bombay Baja have created their own unique style by combining popular Indian melodies together with the powerful rhythms of the Dhol drum. 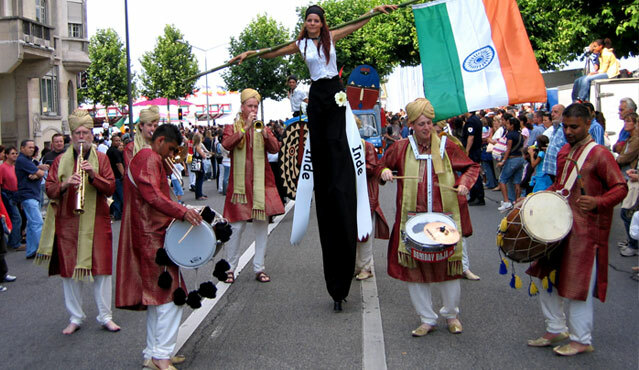 They dress in eye-catching outfits and have the versatility to perform processions on the streets as well as being able to play on a stage. Bombay Baja performed at the premier of Shilpa Shetty's film Metro and also appeared in the Blockbuster Bollywood Movie (Salaam-e-ishq) starring Salman Khan & Priyanka Chopra. 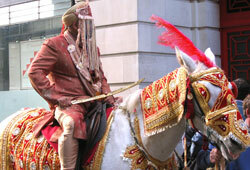 The shooting for the song "Tenu Leke" took place in Trafalgar Square, Millennium Bridge and Oxford. This song was featured on Jonathan Ross's Film 2007 and is one of the biggest blockbusters of 2007. There are a host of other superstars in the film including Anil kapoor, John Abraham, Govinda, Vidya Balan, Akshaye Khanna, Ayesha Takia, Sohail Khan, Perizaad Zorab, and Juhi Chawla. They also appeared alongside John Abraham in the movie Jutha hai sai (1800 love). 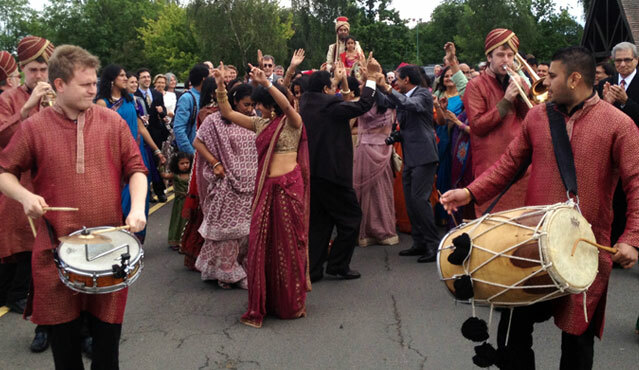 They have become one of the most sought after Asian Wedding bands in the UK, here they perform a procession into the Gurdwara, Mosque or Mandhir and then go onto introduce the bharaat (bride groom and his guests) to the brides family for the Milni (Meeting) ceremony. 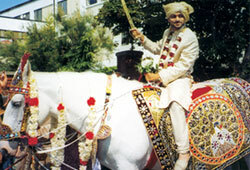 Asians weddings are usually a very grand and colourful occasions with hundreds of guests, Bombay Baja guarantee to get the guests up and dancing and are usually one of the main highlights of the wedding. 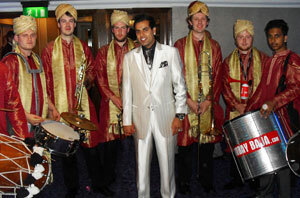 They have performed at numerous weddings and recently performed at the wedding of UK Bhangra Star- H Dhami. 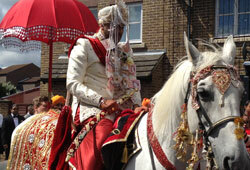 Bombay Baja perform all the top Bollywood, Bhangra and Punjabi tunes as well as Indian wedding songs. 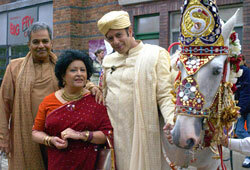 Bollywood is based in Mumbai (India) and is the home of the biggest film industry in the world. Indian movies are usually musicals and thus the soundtracks from Bollywood movies achieve the biggest sales figures in the Asian music industry. 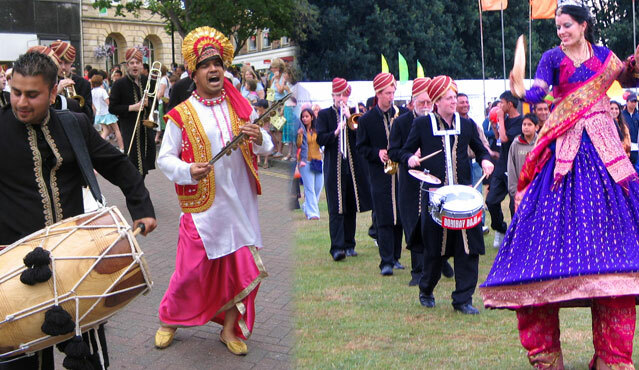 Bhangra music originates from the UK and is a fusion between Punjabi folk together with influences of western pop music. 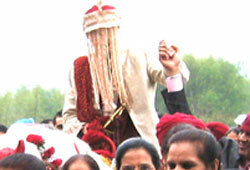 It usually contains the powerful beats of a Dhol drum and is undoubtedly the most popular form of Indian dance music. Copyright © 2013 Bombay Baja. All rights reserved.